The latest Galio rework is definitely the star of the show this patch, and most of the other champions are largely the same. However, Orianna's latest rework brings an already powerful professional play to the top tier in solo queue, and Irelia is making a late blooming rise in the top lane. 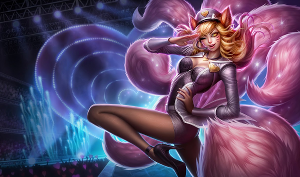 Ahri [God Tier Mid] - Ahri's consistently topped the charts as an extremely safe pick that has the capacity to waveclear, roam, and initiate team fights with great success. Her low cooldown gap closer acts as both an offensive and defensive mechanic, and her ability to beat champions without landing a single skill shot late game results in a champion that is incredibly strong, even in the hands of relatively inexperienced Ahri players. Galio [Tier 1 Top] - As a top laner, Galio works well as a high wave clear champion with a safe laning phase. His trading power is nothing to scoff at, and his crowd-control abilities allow him to play similarly to Maokai and Nautilus pre-nerfs. Meanwhile, in team fights he acts as an amazing secondary initiation or peel, resulting in high potential for turnarounds. Galio [Tier 2 Jungle] - As a jungler, Galio's post-6 ganks are extremely potent when combined with high damage lanes. However, his pre-6 ganks need a bit of practice since the duration to hold his taunt needs experience to execute to its maximum potential vs someone with a simpler gap closer and crowd control mechanic. Galio [Tier 2 Support] - Support is my least favorite role for Galio right now, but that could change as players learn how to use him better and new mechanics come into play. As a support he deals a decent amount of damage, but seems to be more of a crowd-control specialist than a poke champion. His magic resist shield also is not quite as effective in a lane where the primary sources of damage are generally the AD-based marksman. Graves [God Tier Jungle] - Graves as a jungler is by and large the second most popular jungler in the game right now, right behind the super fun Lee Sin. However, his mechanics are much easier and his range much larger. This results in an extremely easy to execute champion that can duel pretty much anyone in the game successfully. Irelia [Tier 1 Top] - Irelia was a bit of a sleeper on the Blade of the Ruined King update, but as it stands her Trinity into Blade of the Ruined King build is stronger than ever before, and she's pretty much unstoppable late game once she picks up her core items. Jhin [Tier 2 Marksman] - As a marksman, Jhin isn't exactly bad right now. However, in solo queue, support players generally pick up Lulu or Janna, whereas Jhin synergizes better with either engagement supports or high damage supports rather than simple peel as a result of his low sustained damage and high burst damage. Leblanc [Tier 2 Mid] - Leblanc players are still mixed with Q max vs W max. Q max players are doing okay right now, but players that continue maxing W are drastically bringing down her win rate. Rammus [Tier 2 Top] - Rammus currently has one of the highest win rates as a top laner, which is why its important to understand the statistics that you're looking at. He's got an extremely low play rate, but yes, he is incredibly good as a counter against melee AD-based champions.